Surprised expenses are going to occur this week. No one will succeed in harming you emotional or in any other way. You will tackle things with courage. Those who are from public serving sector will get what they want. Your personal life is going to be great especially in the starting days of the week. Love Predictions: Trust is the backbone of any relationship. So, in this week, you have to make sure that you are maintaining that trust. First day is very much likely to give you favorable results but this week wants you to be careful. In the middle days, you must take out some time for each other. It will be easy to manage time in the ending days. Remedy: Control your anger and chant Beej-Mantras of Mars. Businessmen will get chance to connect with effective people. Money is coming from other places also other than your earning source. Avoid gambling or anything that is against moral values as the effect of Jupiter will only support good things. Your personal life might be less passionate. Pregnant women need to be very cautious. Love Predictions: Make sure you are not taking risk in this week. Married couples might have little tiffs though this will not affect their love bond. Singles are suggested to avoid any kind of quarrel and maintain decency in their relationship. Even though the start to this week is favorable, the ending days will be a mixture of good and boring days. Remedy: Go for pacification of Rahu-Ketu if a newborn is coming in your home. If Dasha (period) or Antar-Dasha of Jupiter, Moon and Venus is there, you will have immense money this week. People will respect you for your work. Additionally, the natives who are from media, glamour, education will have great time. Personal or domestic life seems to be a little difficult. Any elder lady, maybe your mother, might fall ill. Take care of your health as well as yours. Love Predictions: Maintain purity in your relationship and do not let anything harm your image. If you are not sure whether you want this affair or not, let this feeling go as it might be the result of stressful days. This phase of doubtfulness will pass soon and harmony will prevail in your relationship. A zig-zag graph for your love life is predicted in this week. Remedy: Do not drink & drive. Perform pacification of Rahu. Luck is totally on your side if you are ready to put in some efforts to get what you want from life. You will be more courageous and will also be respected for what you have achieved so far. Be cautious that you do not get overconfident about it. Happiness is knocking your door. Take care of yourself so that your enemies do not harm you. Love Predictions: There might be chances that you both will indulge in a fight and behave immaturely. Do not hold your attitude to such an extent that you both start feeling bad. Enjoy the present days instead of complaining about something that is has gone. Betterment will be observed in your love life as the days pass. Remedy: Control your impulse and offer water to Moon regularly. Even though you are close to financial gains, it cannot be said that this time is in your favor. You have to be very patient as you might want to try wrong ways to earn more money in a short period of time. Do not step forward to start anything risky especially at your workfront. Avoid arguments and take care of your health. Love Predictions: In general, this week is having favorable time for you both. So, plan a great lunch or dinner together and enjoy. Your partner might complain about something but it is suggested to make them understand your feelings for them instead of getting angry. Doing so will fetch goodness. Remedy: Chant Maha-Mrityunjay Mantra regularly. You have to be careful regarding your life this week. Your business life is looking a little challenging. Health has to be taken proper care. Your partner might come up with some misunderstandings, but do not push it and end with an unnecessary argument. Talk carefully and avoid over thinking. 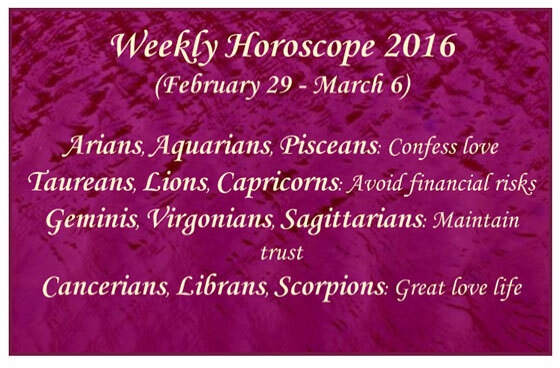 Love Predictions: Even though this week is on your side, you have to make sure that you are not being egoistic. Since, ego can also do harm, you should ignore it to have a peaceful romantic life. A great time for you from the beginning itself is predicted if you can make sure that no one has got the chance to point fingers on you. Happy time for you in the weekend. Remedy: Go for the ritual of Maa Katyayani is going through Manglik Dosha. All wrong happenings will end now. Your health will be great, you will be relieved from all financial loans and your enemies will also fail. The ones who are from social service background have an amazing week. Just be careful of what you are speaking. If you are planning to have a child, this time should be avoided. Be careful at office. Love Predictions: You will get a mixture of everything in this week but being rigid has to be ignored. Starting days might be average but things will turn favorable after few days. You can plan a meeting at some place safer to keep yourself away from defamation. Any of your female friend might help in planning this meeting. Remedy: Do not wear red clothes and chant Surya Gayatri. If Dasha (period) is not in your favor, stay cautious if you are a expecting mother. Students who are from archeology or history background will have great results. Working people might get promoted or have changed job location. Avoid taking stress and do things that make you happy. Stress is not good for you especially in this particular week. Love Predictions: Have fun during this week and forget about being angry all the time. There are possibilities that you might not be able to meet much in the starting days but will be in touch through phone or chat. As the days pass, things will be much better. Get ready as you are going to have an amazing time together. Remedy: Help the needy as per your abilities. Worship Saturn and Lord Shiva. Lovers as well as married couples are predicted to be spending great time together. Happiness will enter your family. Journeys will be great. Social workers and people who are into politics have an amazing week. But taking care of health is also very important. You will succeed in buying a new house or a new vehicle. Love Predictions: Not only anger and controversy have to ignored in this week, you have to let go off the feeling that you are not with the right person or have done any mistake in being with him/her. These things might try to overpower your love but do not let this happen. Talk to each other and clear all the misunderstandings. Remedy: Avoid sweets and chant Jupiter’s Beej Mantra. The natives are suggested to be true to their hard work and ignore being dependant on your luck. You might have a quarrel with your sibling. Your intelligence will support you to get things done in the right way. Have patience while taking decisions related to your domestic life or finances. Taking care of these things will help. Love Predictions: You will feel blossom all around you. If you are single, there are chances that you might meet the one who will be there for you forever. the starting days will be full of love and you will be in touch with each other through phone or chat. You will be feeling satisfied with the life you are living with your partner. Remedy: Worship Lord Ganesh and avoid addiction. After some hurdles, the financial life is going to be great throughout the week. Married couples might find this time a little challenging and less romantic. Talk when it is needed and think before you act as some opportunities might come to you. Maintain good relations with your seniors at office. Stay alert from your enemies and take care of health. Love Predictions: Basically this week is going to be good one for you. You might find your love of life in office itself. However, make sure that you are not taking away your boss’s love. Things will keep on going better as the days pass and you will be able to share your true feelings together. Be careful in the weekend. Remedy: Keep yellow mustard in your home after worshiping it in Lord Bhairav temple. You will be full of energy and might do something that is not right. So, be cautious and act intelligently. Your luck is making you earn a lot of money. Love life is also going to be blissful and satisfying. If Dasha (period) of Rahu and Mars is there, you might have some tensions in your married life. Love Predictions: This week will be a mixture of everything. Even if the start might not be so romantic, you will have that essence back in your love life. So, it will be good for you to be moralistic initially. There might be chances that you might miss that charm in your relationship. However, the weekend allows to confess your feelings. Remedy: Worship Lord Vishnu and have patience. Love Predictions are exclusively prepared by our expert astrologer Pt. Hanumman Mishra. How Is Mars Transit In Scorpio For You?